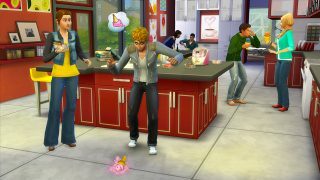 But besides making things look cooler, your Sims will also have a lot more cool stuff to do in the kitchen. With the new Ice Cream Maker, your Sim can make ice cream, gelato, or soft serve! Better yet, your Sims will be able to garnish their ice cream with a variety of toppings. Banana slices, whipped cream, sprinkles and more – your Sim’s sweet tooth will be fulfilled. There are 30 flavors to create, some of which might leave your Sim with… unusual abilities. Excited to check out The Sims 4 Cool Kitchen Stuff? Learn more about upgrading your kitchen with Half Walls – and here are some tips on Creating a Perfect Pool, because we’re not going to tell your Sims they can’t swim after eating.